Will cockroaches really be the last survivors on Earth? What Wall-E gets wrong about the apocalypse. Pixar’s post-apocalyptic love story Wall-E finished No. 2 at the box office over the Fourth of July weekend after hauling in $65 million the weekend before. The film depicts a future Earth abandoned by humans, blanketed in garbage, and nearly devoid of life. 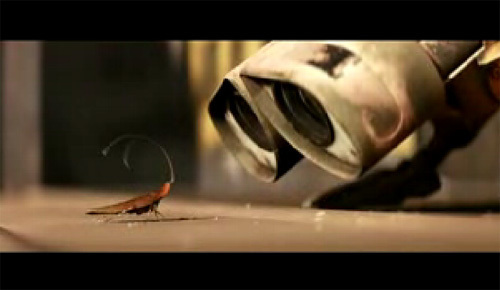 At the outset, Wall-E, a robot, has but one companion: a friendly cockroach. How did we come to believe that cockroaches will outlive everything else on Earth? In 1962, H. Bentley Glass, a Johns Hopkins geneticist, told the New York Times that in the event of nuclear war, “the cockroach, a venerable and hardy species, will take over the habitations of the foolish humans, and compete only with other insects or bacteria.” But studies over the last half-decade, such as those conducted by the United Nations Scientific Committee on the Effects of Atomic Radiation, have found that these “other insects” are more likely to reign in the age after humans; the cockroach might, in fact, be one of the first bugs to go. More recently, the television show MythBusters tested the effects of radiation on several kinds of insects and discovered that tiny flour beetles were the hardiest—with some surviving a dose of 100,000 rads. (Click here to watch the MythBusters segment.) Organisms that aren’t classified as animals are even better-equipped to handle a nuclear fallout: certain bacteria, protozoa, mosses, and algae might thrive long after roaches and flour beetles bite the dust. In any case, the cockroach is a proven survivor. Most researchers believe the roach’s fossil record dates back to approximately 300 million B.C., a period predating dinosaurs by nearly 70 million years. Additionally, the roach knows how to get by during tough times: It can survive on dead or decaying organic matter and can even live without its head for more than a month. Explainer thanks George Beccaloni of London’s Natural History Museum, Grzegorz Buczkowski of Purdue University, Andrew Karam of Rochester Institute of Technology, Joseph Kunkel of the University of Massachusetts-Amherst, and journalist Richard Schweid.